It seems I’m spending a lot of time in the figure studio this week…..
We had Marshall back in the life drawing studio this morning. He is such a great model, with wonderful expression, a vivacious personality, and knows how to hold a pose! 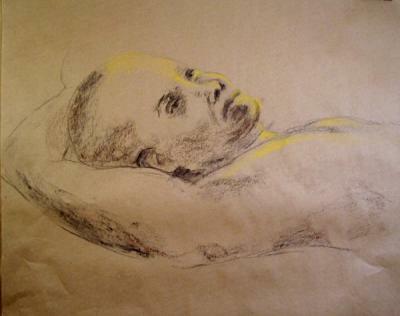 These are both 19×25″ on Canson MiTientes paper, charcoal and pastel. You can click either image to enlarge it to 600 pixels. The pose below was a lot harder to draw than I thought it would be! This is a the headquarters of Putnam County Land Trust. It will be housed permanently over the fireplace in the building. The Land Trust has been renovating this building for years, and the painting will be unveiled at the grand opening in the spring. PCLT owns about 140 acres here. A local resident, with property bordering the preserve, left her house to the Land Trust in her will, to be used as a headquarters and for educational purposes. This site is only about a half mile from me, so I’m very excited about doing this painting for the Land Trust! Below are various stages of the painting in progress. 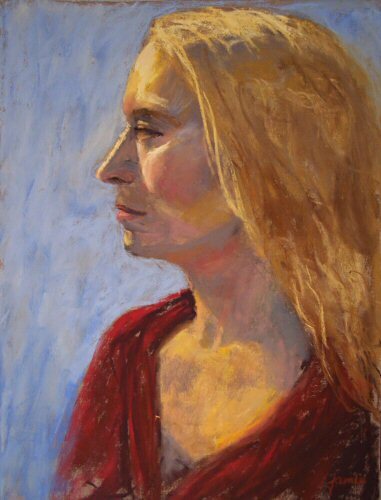 This portrait of Amy was painted from life in about three and a half hours of posing time. I’ll do a few more tweaks, but the model time is up, so it’s pretty much done. $360.00 plus $20 shipping and insurance within the Continental United States. For local sales, shipping charge will be allocated to NYS Sales Tax. Please email me at JamieWG@aol.com for International purchases or with any questions. This morning in open studio, I finished off this painting of Jean. I wanted to take it a bit further than this, but at 16×8″, the painting was just too small to work it more—at least until I get new glasses! The head is only about an inch and a half high or so, so you can imagine trying to paint facial details standing at an easel. Once I was done with that, there was still an hour or so of studio time left, so I started a monochrome oil portrait of her, then wiped it off at the end of the session. Why’d I do that? I have no idea! I was actually pretty pleased with it, but after the first wipe with the cloth, it was too late to go back. Jean will be back next week and I’ll paint her from a different angle. 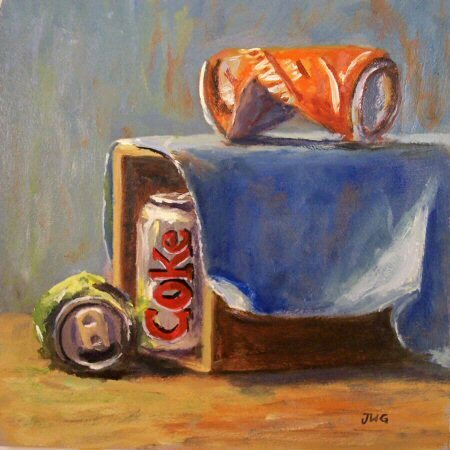 Who’d have thought that empty soda cans could make such nice painting subjects? 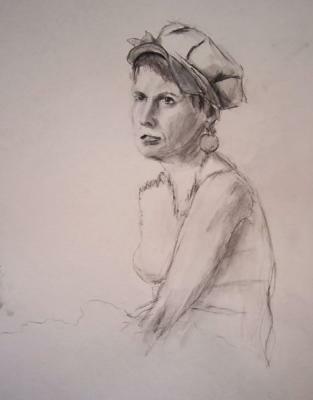 This was about a 1/2 hour sketch of Michelle. The poses aren’t that long, so I focused mostly on her face. I think I’m finally starting to get the hang of the way these carbon pencils react with water. There is definitely a learning curve with them. I like that they can get way darker than graphite, and thus extend the value range when working in monochrome. My apologies to those who tried to get to my site today and were unable to get the front page to load. The problem seemed to be caused by Mapstats. I took it off my site and now it’s loading like lightning. This pastel of Jean was done start to finish in a three hour pose, minus breaks. I really loved the way the light hit her face from this nearly backlit position, and the influence of the burgundy velvet on her skin, combined with the warm light. 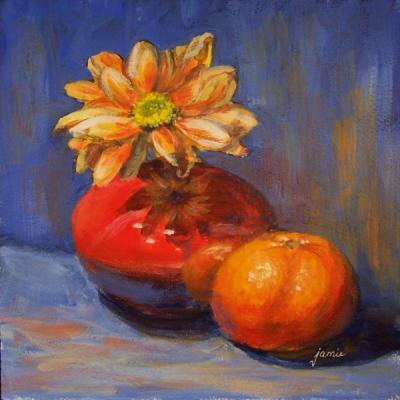 I love this orange flower paired with the clementine, and the bright red, Marilyn Price vase seemed the perfect item to tie the two together. 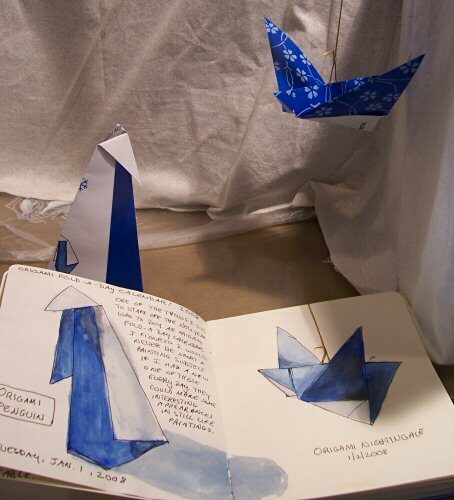 I draped a blue cloth behind them to make the warm colors pop. 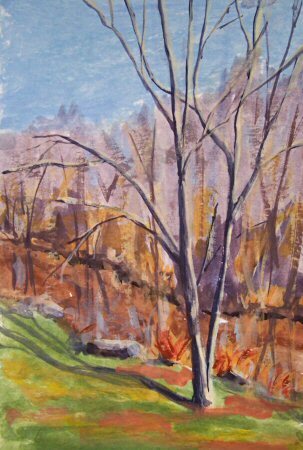 This is another painting of the little brook that runs behind my house. 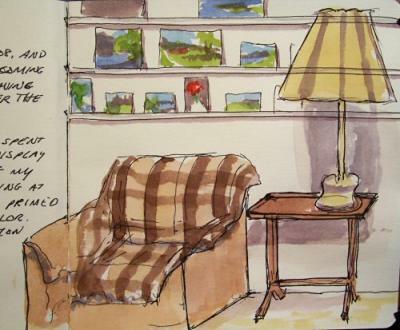 I sketched it in the morning light from the kitchen window, which overlooks the scene. You’d never know by looking outside that it was freezing cold. With the snow gone and the sun shining, it could be early spring…That is, until you step outside! This is a scene that I’ve been wanting to paint for over three years, and I finally got around to it! 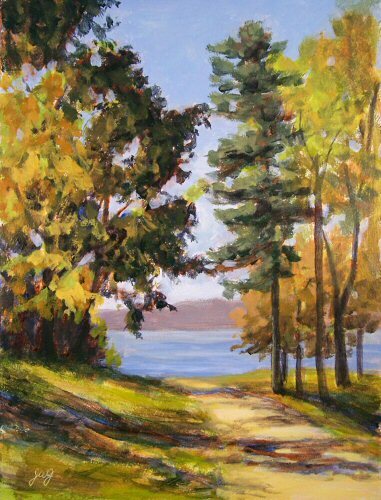 It is a view of the Hudson River from Hyde Park, New York. 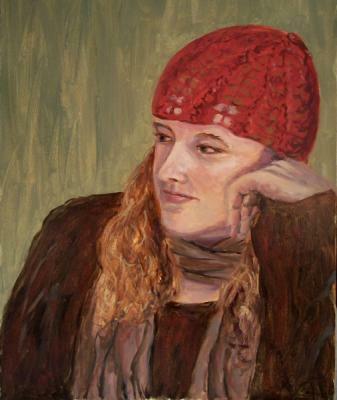 This painting was done from a live model over the past two weeks. 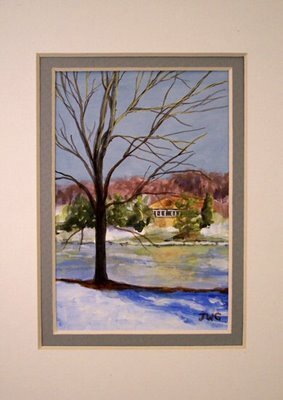 This acrylic painting was done from a photo I took of a frozen pond in Somers, New York. I’d done a watercolor painting of the scene on location in my sketchbook, and was so captivated by the scene that I had to do it again in a form that could be framed. 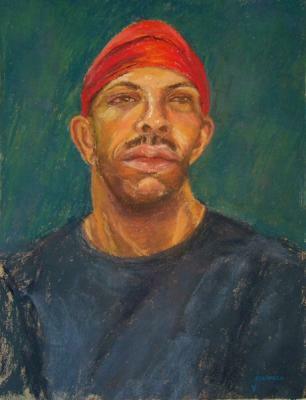 The painting is 4.5×3″, mounted to a backing board and double matted to 5×7″ as shown below. It will fit into any standard 5×7″ picture frame. 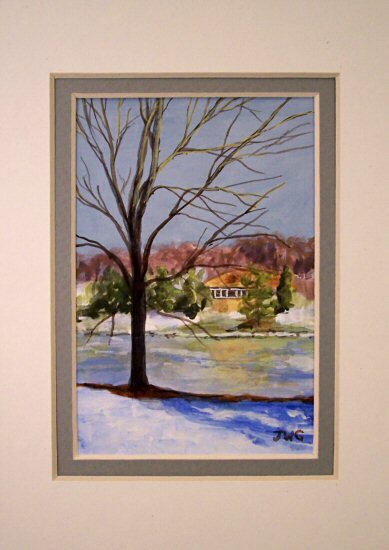 Please email me at JamieWG@aol.com if you are interested in this painting. 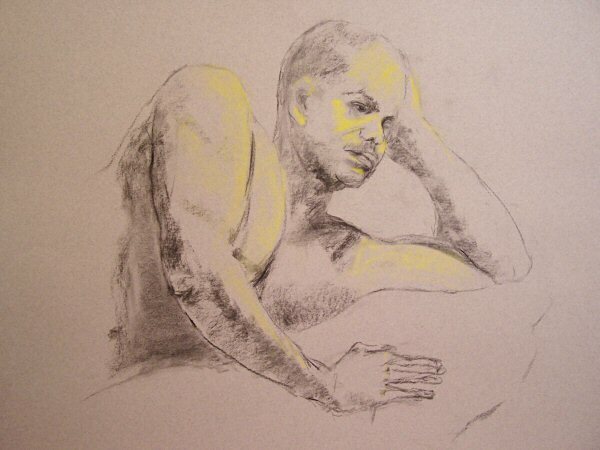 Marshall is a fabulous model with oodles of personal charm and charisma, and interesting features to draw. 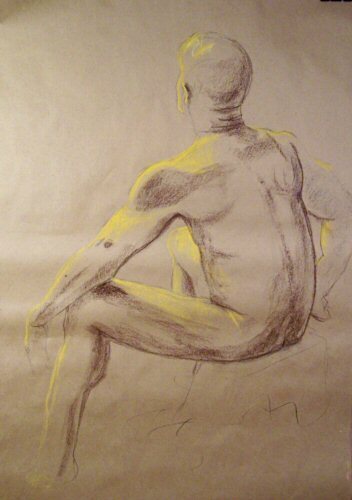 Here are some of my sketches from today’s life drawing poses. 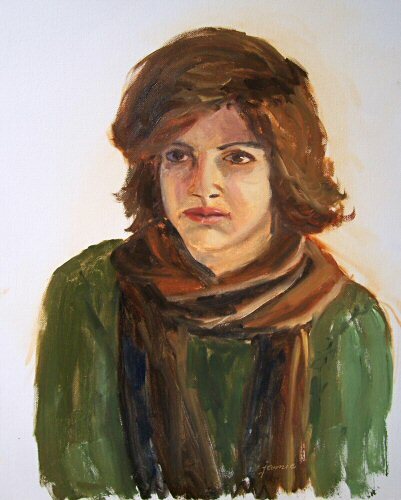 This oil sketch took about 2.5 hours, minus model breaks. 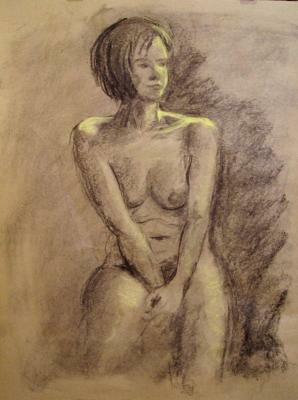 Many thanks to Julia for being such a great model, and to Alan Reingold for a wonderful portrait class. 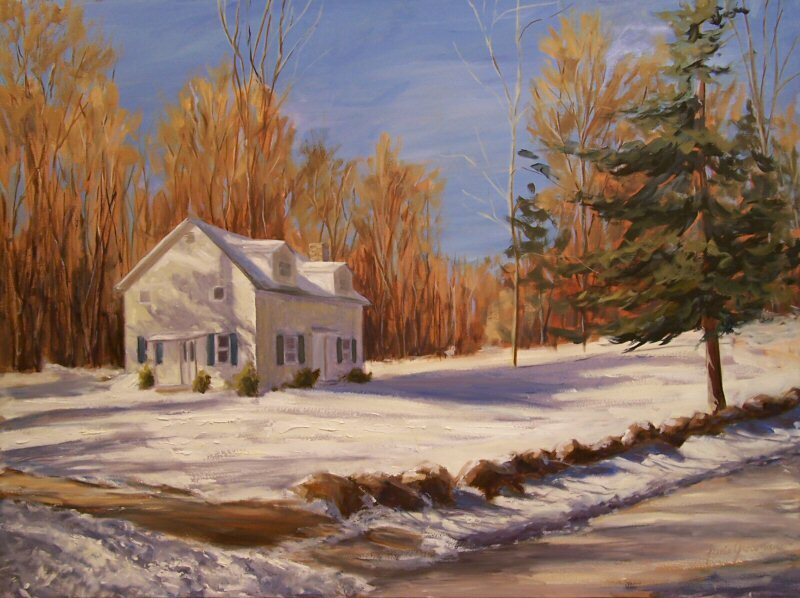 I’ve decided to dive back into some classes during the cold winter months, and take the opportunity to use my indoor, non-plein air time for artistic growth. Taking this time to work and receive critiques from artists I so admire is an opportunity I can’t pass up. Portraits and figures are great practice for any subject and style of painting, and I only have time to do a lot of that in the winter. More to come in the weeks ahead! For my landscape afficionados, not to worry! You’ll be seeing some landscapes emerging over the next several weeks as well! Click the image to enlarge, and then hopefully you’ll be able to read the text! 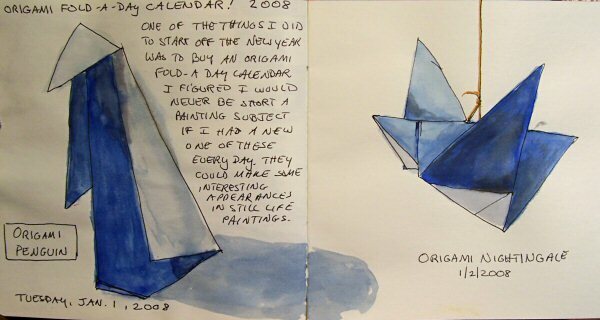 I was a little disappointed as I turned to do my daily origami, to see that the Origami Calendar I got for 2008 doesn’t have pages for the weekends! So, I turned to a couple of the items listed for the current Wetcanvas Scavenger Hunt, and sketched the flowers and bow instead with the Golden Fluid acrylics left in my Stay-wet palette. I added some cadmium yellow light, needing the opacity for the gold edge of the bow. 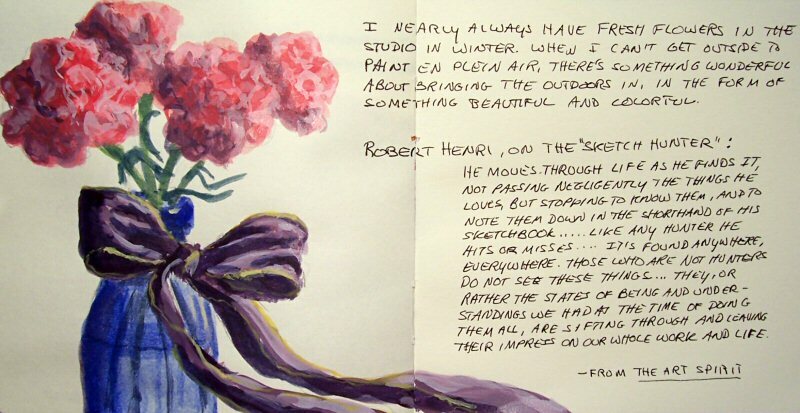 I’ve started reading The Art Spirit by Henri. 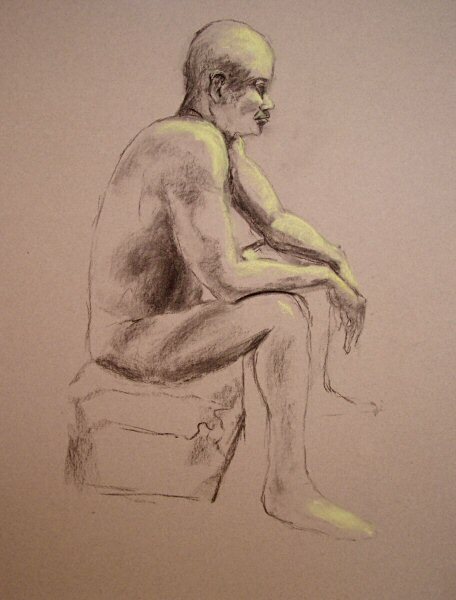 I came to a section where he talks about artists who do lots of sketching. That would be me! hahaha….. I copied it into my sketchbook. I suspect my sketchbook will be accumulating many quotes of his as the new year gets underway. 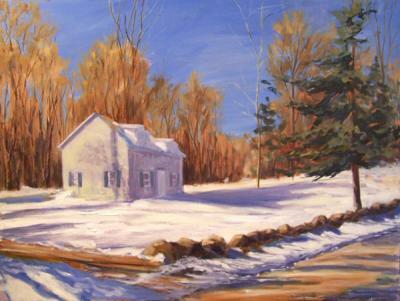 RiverWinds Gallery has asked to have some of my work there beyond the current show, so I’m hoping it will snow soon in order to get more reference images for winter paintings! I found one image last night in my files that I really like. 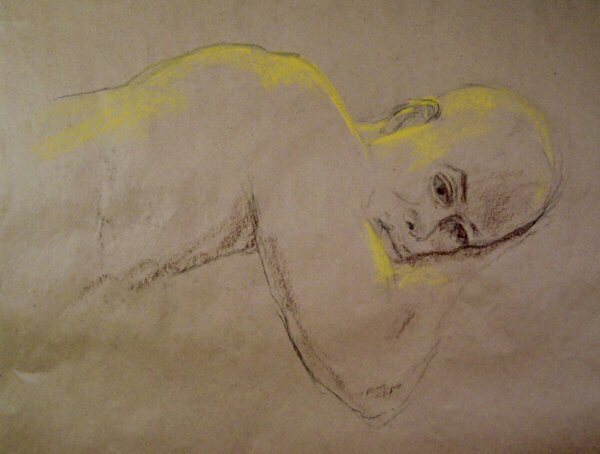 I painted it once before, many years ago. The painting was sent off to the new owner, framed, via UPS. It got totally trashed in transit, and all that was returned to me was a piece of the broken frame and a shred of torn paper. I’ve been meaning to paint it again ever since then. Hopefully the new painting will meet with a better life! $600.00 plus $25 shipping and insurance within the Continental United States. For local sales, shipping charge will be allocated to NYS Sales Tax. Please email me at JamieWG@aol.com for International purchases or with any questions. 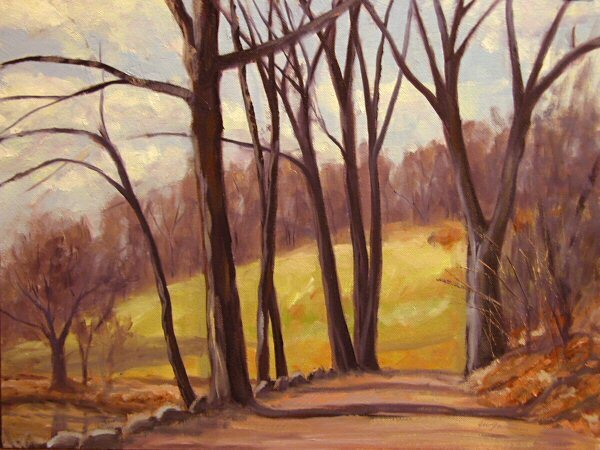 This is another painting that started out plein air (on location), this time in the Rockefeller State Park Preserve. The subdued colors didn’t quite have enough “zing” to them, so I bumped it up a notch in the studio. 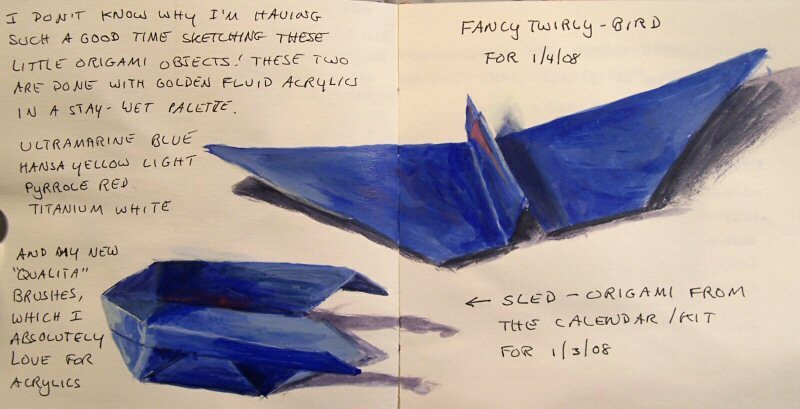 Here are a few sketches done today using Golden Fluid Acrylics: Ultramarine Blue, Hansa Yellow Light, Pyrrole Red, Titanium White and (for the box only) Transparent Red Oxide. I diluted just with water where necessary (no medium) and used Taklon brushes. A month or so ago, I bought myself a 2008 origami calendar. It’s very cool! There’s a page for each day with folding instructions. I thought the shapes and colors would be fun to sketch from time to time and to use in some still life paintings. I’ve been considering separating my sketches into a separate blog, rather than mixing them in here amidst my paintings. I’d love to hear what my viewers think of that idea. Would you rather see everything all in one place, or are you more interested in viewing a site with just the paintings, or just the sketches? 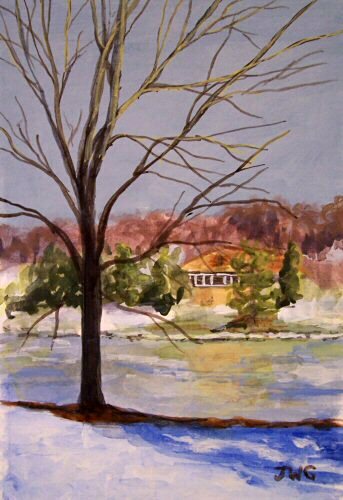 This painting began en plein air at the Mills Mansion property along the Hudson River. 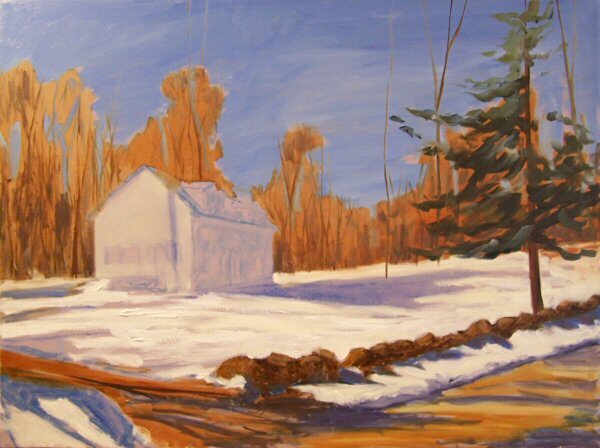 I finished it up in the studio today from photos taken on location. 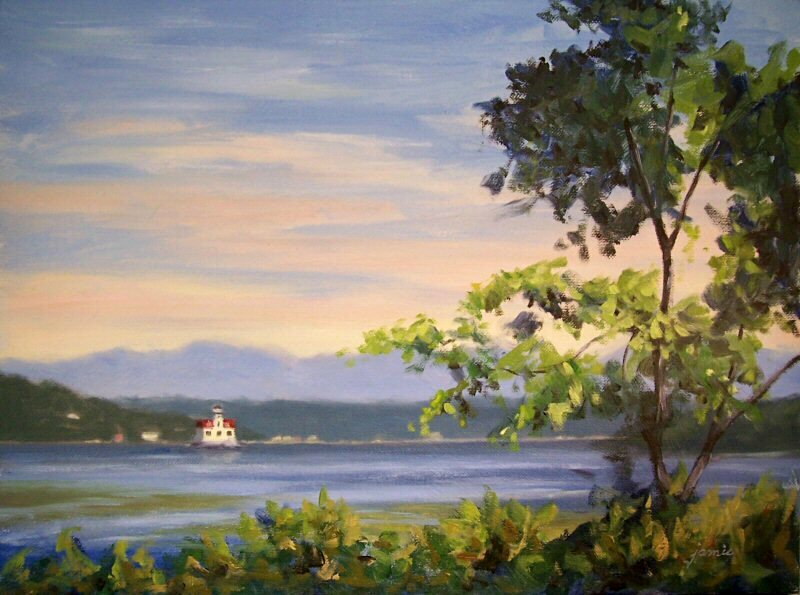 It’s a spectacular view, with the blue Catskill Mountains way in the distance, and the Esopus Lighthouse catching the light and shimmering above the Hudson River. 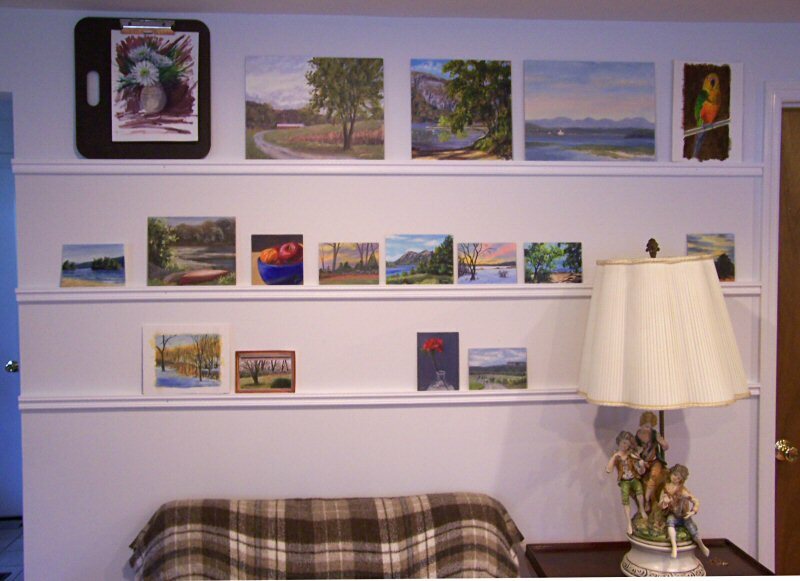 This is what I did with much of my New Year’s Day—put up drying/display rails in my studio. See the post below this one for photographs and details about the installation and molding I used. The post below shows more images of the drying rails. Drying/Display Rails installed in my studio! For quite some time now, I’ve been trying to think of a practical way to store drying paintings and works in progress where I can see them. 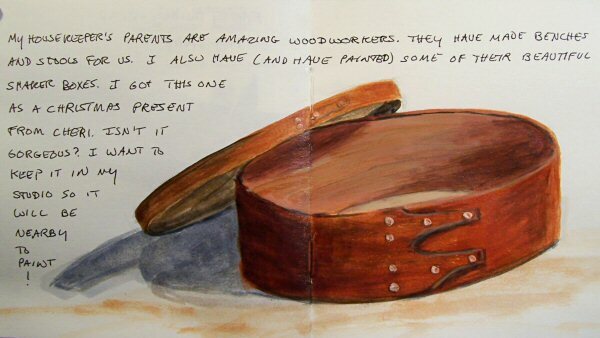 I find that as I look at them, I see areas I want to touch up or improve upon. I put together ideas from a couple of people, and set out for Home Depot to see what I could find that would suit my needs. I was thinking I’d probably have to build some narrow, ledge-like shelves using two different types of wood molding. 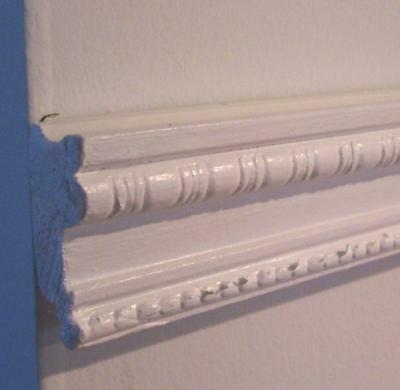 But then I found this great molding that does the whole trick! It comes out from the wall about 3/4″, and has a U-shaped groove on one side that the painting panel can set into. Because that groove is fairly shallow, it doesn’t block my view of the lower part of the painting. The front is a very nice, decorative pattern. I cut the molding strips to the length of the wall, and primed and painted them with semi-gloss in a color to match the wall. I wanted them to blend in as much as possible. My dear husband helped me mount them. 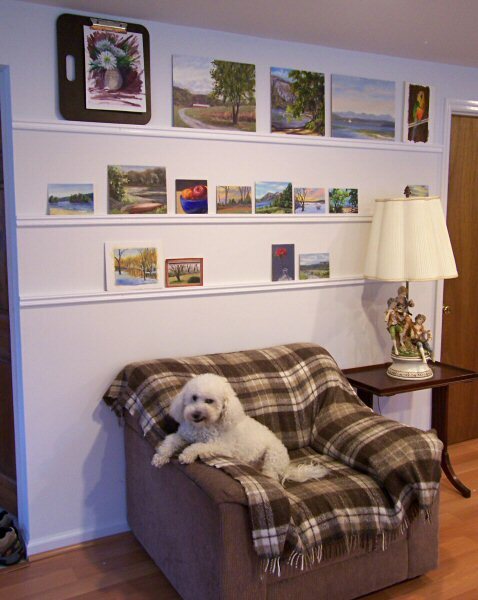 The top row allows for paintings up to 16 inches high (for standard 16x20s horizontally, or 16x12s vertically). The middle rail is set for paintings up to 12 inches tall. The lower rail will hold up to 10″ high works. Paintings larger than those would be on stretched canvas, and not displayed on the rails. I’m so excited! I think this is going to work out really well for my needs. I might do another wall too if I end up needing more space. I’d been hoping to have this done in time for my “studio tour” a couple of weeks ago (click here to see that post), but better late than never!